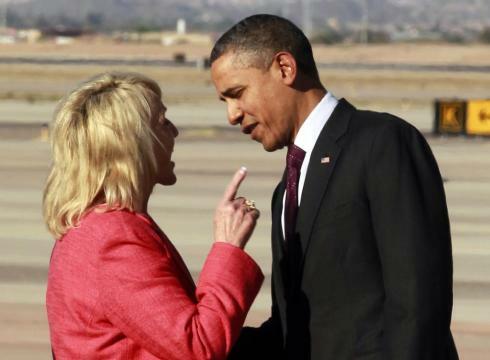 What makes Jan Brewer so mean? Arizona Governor Jan Brewer and Joe “America’s toughest sheriff” Arpaio are accusing Barack Obama of granting illegal immigrants de facto amnesty. The immigration problem could be settled amicably, Arpaio says, if all the illegal aliens went home, but since that is unlikely to happen, earnest public servants must do what they were elected to do. Jan Brewer grabbed the big headlines by announcing that the Dream Act young people Obama saved from deportation won’t be getting any state services in Arizona–and that includes drivers’ licenses. As the Daily Beast article below suggests, Brewer probably lacks the authority to make this call, but I doubt she cares about the legal fine points. Like Obama’s executive order, her counter move is primarily a political act. After deporting more people in his first term than the last 14 presidents combined, Obama needed to mend fences with the Latino community. Brewer is hoping that her base, Arizona’s white retirees, are just mean enough to reward her spiteful gesture. Brewer needs to distract voter attention from a fiscal meltdown driven by Arizona’s mortgage mess. It was recently discovered that the state’s Tea Party Republicans diverted $50 million (Arizona’s portion of a nationwide lawsuit against five mortgage giants), money earmarked for foreclosure prevention programs, to build 500 new private prison beds (I wish I was making this up). With scandals like this bubbling in her backyard, Brewer wants conservative voters fixated on her willingness to stick it to the Dreamers. Question: Are Arizona’s aging white voters as riddled with racial resentment as the governor thinks they are? The GOP governor tries to thwart Obama’s decision allowing some undocumented kids to apply for work permits by issuing her own directive denying them driver licenses. Critics call her order mean-spirited and ill-advised political posturing. Zulleth Romero was 12 when she and her mother trekked through the oven-likeArizona desert. The two ran out of water and Zulleth’s mother collapsed when she reached the highway, where a smuggler picked them up and transported them to Phoenix. Both survived and the girl, now 18, recently graduated with honors from a Phoenix-area high school. On Wednesday, like many of the nation’s 1.7 million young, undocumented immigrants known as “Dreamers” who were brought illegally to the United States as kids, a jubilant Romero began applying for a two-year renewable permit to work and stay in the United States temporarily, thanks to an administrative directive issued by President Obama in June. Zulleth says she celebrated because finally she could drive and work legally. Then that same day, Arizona Gov. Jan Brewer, who had become a conservative superstar after wagging her finger at the president on an airport tarmac and subsequently calling Obama’s Dreamer directive “back-door amnesty,” fired back at Obama by issuing her own directive. Federal law will prevent most Dreamers from accessing Medicaid or food stamps, and Arizona law bans them from enjoying a few state benefits, such as state-subsidized childcare, unemployment, and state contracts. Much of Brewer’s administrative order was redundant, but seemed to set off yet another skirmish in the state’s epic battle between old white people and young brown people. But Brewer’s driver-license prohibition could spell misery for Arizona Dreamers. In Phoenix, a sprawling city surrounded by a web of suburbs with limited public transportation, many have no choice but to drive to work. While Democrats blasted Brewer for mean-spirited anti-Obama gasbagging with her executive order, the ACLU of Arizona and national immigration lawyers and activists scrambled to read Arizona’s motor vehicle laws Thursday. Their conclusion: Brewer doesn’t understand the linkage between federal immigration law and Arizona’s driver license statute. And that could open the Grand Canyon State to a slew of lawsuits. Brewer, who once accused Obama of giving Dreamers amnesty, now seems to be signaling that Dreamers do not have amnesty. She argues that Dreamers may be getting a temporary reprieve from deportation under the Obama directive, but nevertheless will not be legally present in the United States—and thus can’t legally drive in Arizona. Immigration lawyers counter that the president’s directive will indeed make Dreamers legally present in the country—which entitles them to Arizona driver licenses. The legal debate over the driver licenses centers on the arcane immigration-law concept of being lawfully present vs. having lawful status. Arizona law requires driver licenses be issued to those lawfully present under federal immigration law. Thanks to the Obama directive, Dreamers soon will be lawfully present. The state’s driver-license law doesn’t require lawful status, which Dreamers will not get under the Obama directive. But Brewer “uses presence and status interchangeably,” says Alessandra Soler, executive director of the ACLU of Arizona. And Danny Ortega, a prominent Phoenix lawyer and former chair of the National Council of La Raza, said that for now he’s reserving an opinion on which side will win, but described Brewer’s move as pure political posturing. Brewer’s spokesman, Matthew Benson, said the governor is neither posturing politically posturer nor receiving bad legal advice. The governor’s take is that even with Obama’s directive, Dreamers won’t be legally present in Arizona—and thus state law prohibits them from driving, he said in an interview. Dreamers “have neither legal status nor legal presence….The governor is merely upholding Arizona law, as is her duty,” he added in an email. The upshot: Despite the governor’s executive order, Dreamers probably will be able to drive to work legally, although they might have to take Brewer to court.